Langtang Gosaikunda Helambu Trek starts with a day bus or jeep ride to Syabrubesi, the journey begins entering to the attractive Langtang Valley; famous for the region’s beautiful destination aptly entitled the valley of glacier. Here the mountain valley is brilliant. On either side of valley, mountains rise, towering high in to the sky. The valley offers pine forest, slow moving rivers and swift mountain streams, rugged rock and snow- capped peaks, grassy downs and meadows strewn with daisies and wild Primus. In the upper part of valley there are snow bridges spanning angry torrents, high passes enveloped in mist, tiny lake with iceberg floating on them and water of crystalline brightness. 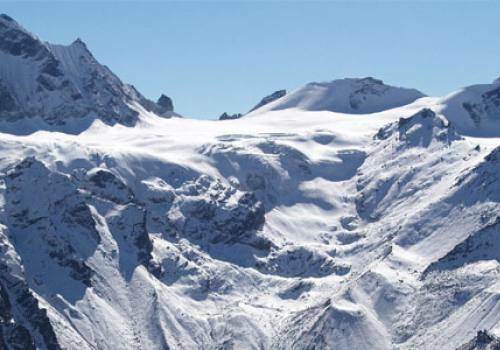 There are also high mountains of slide ice. 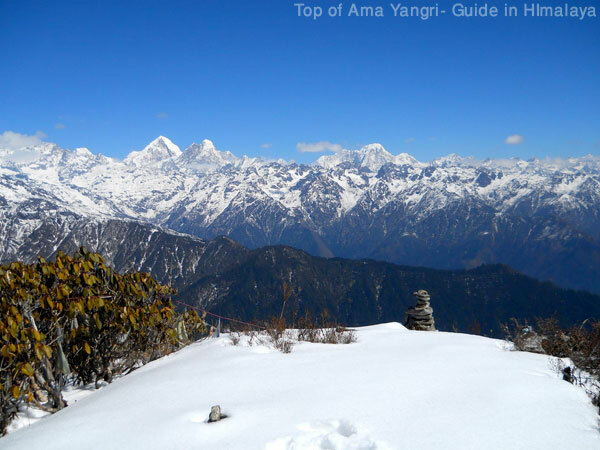 You have a stunning view of Langtang Lirung, Langshisha Ri, Yala peak, Gangchempo, Ganja-La range, Dorje Lakpa many other white peaks from Tesrko Ri which one of the best demanding day excursion from Kyanjin Gompa. Gosainkunda, believed to be sacred land in Hinduism, is spotted with lakes atop the mountain, offering a quiet respite. There are few visitors outside of those who come for the summer festival. During the Janai Purnima (secret-thread festival) in August full moon day every year, Thousands of Hindu pilgrims come here for worship and holy bath. Many Shamans from around the world visit the site in this specific day and the Shamans show their performance in the full moon day. There is a black rock in the center of the lake said to be the head of a lord Shiva. Legend says; Lord Shiva created this high altitude lake when he pierced a glacial with his trident to get a water to quench is thirst from consuming some poison. Another attraction in this trip is Helumbu, the land of Yolmo people where you can see many monastery and ethnic groups and panoramic view of the mountain between Annapurna to Mt. Everest. 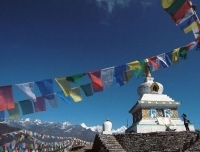 The course is varied- you encounter Lamas and see Gompas (monasteries), Chorten (Stupas), and Mani stone (Prayer walls). Most of ethnic groups believe in Buddhism. If you are in there in wintertime you will see their great festival call Loshar. 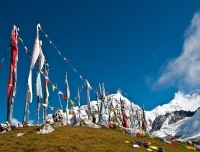 The main feature of this trip are full of diversity, natural splendor, primordial hermitage, cheese factories in Kyanjin Gompa and Chandan Bari, marvelous glaciers, colorful Rhododendron flowers in spring time and breathe stopping views of snowcapped peaks and unique Tamang culture rewards you the most excellent mountain holiday. 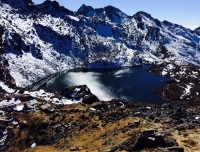 Gosainkunda Lake is magnificent and scenic. Going through the suspension bridge and heading precipitously along a stream. 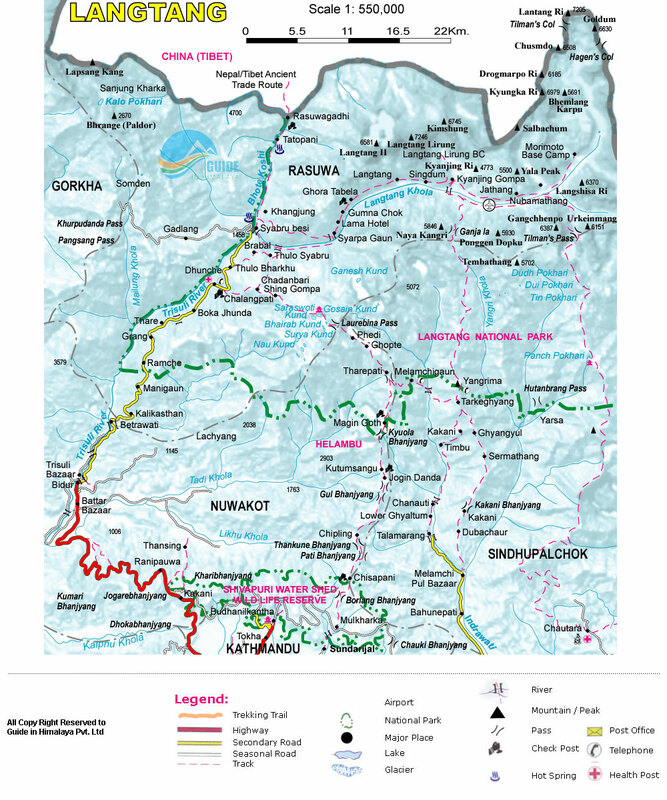 The River you are following is mostly the Langtang River. You can enjoy the walk going through oak, rhododendron and bamboo forests. There is also a variety of wildlife in these forests: yellow-throated martens, wild boars, langur monkeys, red pandas and Himalayan black bears. After hot breakfast we continue our journey to our next destination Langtang. We start our trip ascending towards a steep forest slope to the Langtang River. You cross a bridge and head up with a winding path. 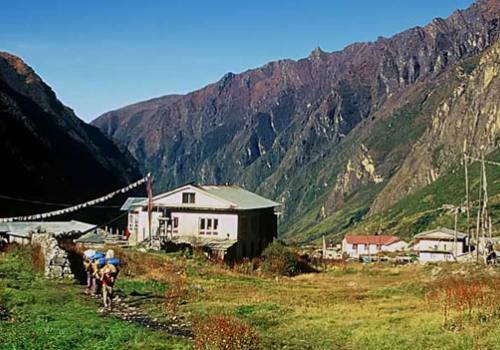 The trail descends into a valley to cross a stream and climbs past several water-driven mills and prayer wheels to the large settlement of Langtang .Overnight in Langtang. Today it is excursion day around depending on your interest. Many people hike to Kyanjin Ri which is at 4,800m and day hike to Tserko Ri (5,000m) for more adventure and stunning mountain scenery. 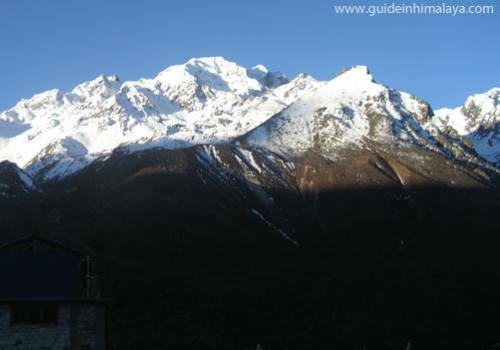 You see Mount Langtang Lirung, Langtang range, Kinshung Himal, Yansa Tsenji and the foot of the huge Lirung Glacier. 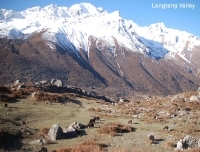 There is an option to hike to Langshisa Khara (The place where monk found his lost yak dead that he was following during when Langtang Valley was found several centuries back, later he skinned the yak and placed it´s skin on a big rock, so still we can see a red rock there because of the red blood of the yak. Back to guest house for Lunch having short rest and walk around the Kyanjing valley with guide. Overnight in Kyanjin Gompa. Today you retract to Lama Hotel. All the way downhill but you will see fantastic views of towering mountain what you have missed on the way up. Take more time and suggested you to walk very slow. First trail decent to river, cross the river and ascend to Thulo Syabru. 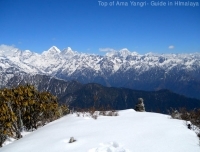 You will see the fascinating view of Langtang Himal and more. 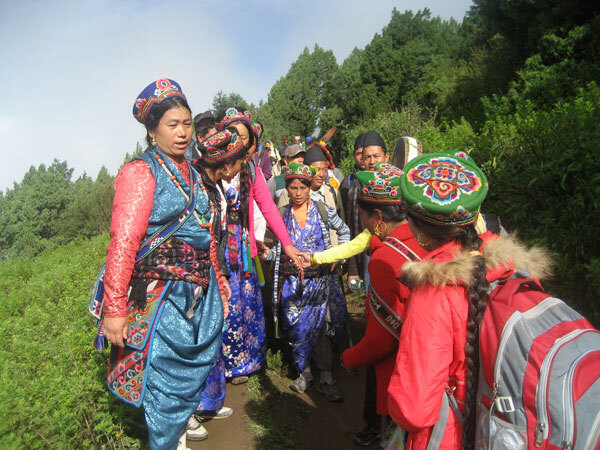 On the way of your trek you will pass through pine and bamboo forests. 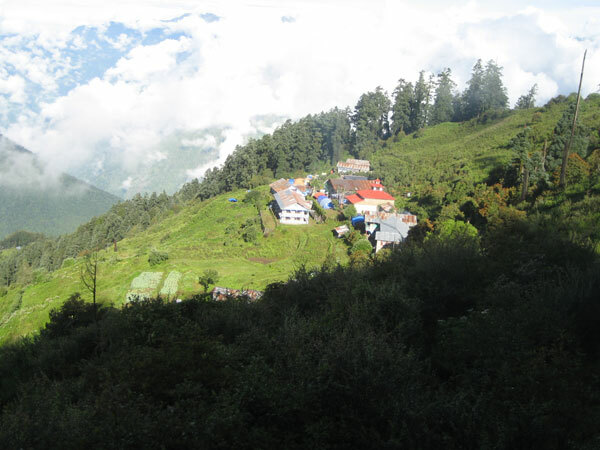 You take the wide trail ascending up to Dimsa village and the trail continues steeply, through rhododendron, hemlock and Oak forests to Shin gomba Dursa Gang which is best place to rest have lunch or tea break, offers an outstanding view over Ganesh Himal Range. 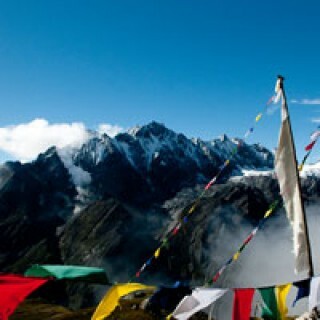 Now the trail is pleasurable to Shing Gompa through the blue pine and rhododendron forest. Shing Gomba is another popular place for Cheese. There is Cheese factory that was founded in 1964. Today is a bit challenge day; the trail is climb, rough and crosses moraines. Passing three more small lakes, the trail ascend and cross Laurebina La (4,609m/15,121ft) after the pass, the path down to phedi and you continue walk up and down through out crossing a rocky hill with pine, rhododendron trees. You slide down through a forested area and climb through a dry river-bed to arrive at a Kharka that is surrounded by rhododendron forest. You climb through the forest to arrive at the village of Thare Pati. 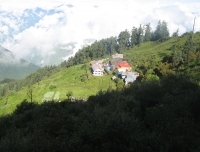 Climbing the ridge directly above the village gives you a marvelous view of the Jugal area. Cross the village and enter a forested area, again descending to Melamchi River followed by yet again climbing to the Malemchi Gyang for overnight. 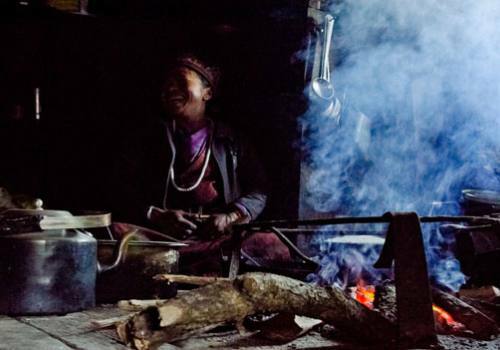 The day you enter a cultural destination it call Helambu Region, walk up to Tarke Gyang where you can enjoy with Sherpa culture with traditional village and monasteries. The stone houses are close together with narrow alleyways separating them. It is worth to do day excursion to Yang Ri Peak locals called Ama Jyomo Yangri and believed to be Holy Mountain. Many people explore ancient old monastreis and surrounding sacred caves where Buddhist deities believed to be meditated here. This place is center of Helmbu attraction for the national and international tourist and Buddhist pilgrims. 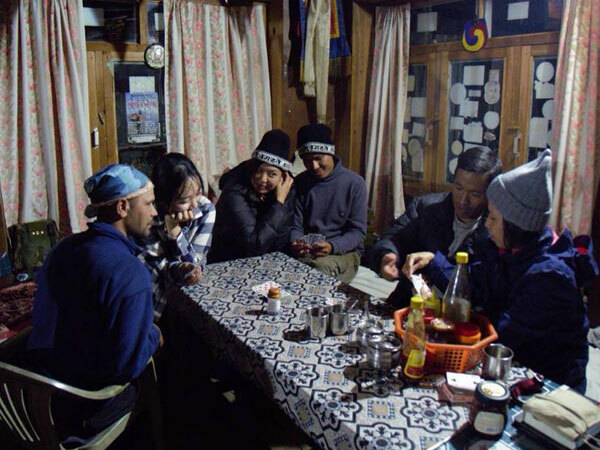 If you would want we can skip one night extra here and your trek will be one day shorter than original itinerary. You will cross small forest with the view of beautiful village of Helembu region. The trail makes a sweep around the wide valley end between Parachin and the pretty Sharpa village of Gangyul. 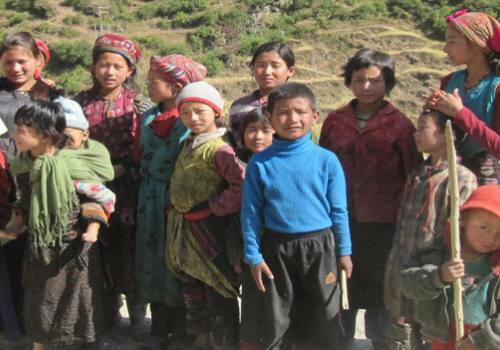 The people of this village practice Drukpa Kagyu Buddhism, the same as the national religion of Bhutan. An experienced, government registered, English speaking local friendly guide. Assistant Guides to assist group to support where necessary as per the group size. Local bus transport to Kathmandu from trek ending point. 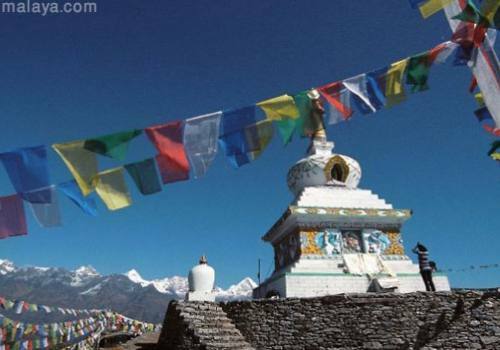 Accommodation, meals and transafers in Kathmandu. 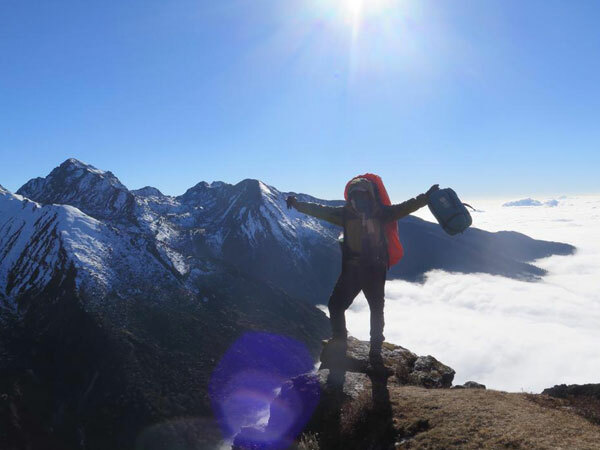 In September 2016, I completed the Lantang Helambu 15 day trek organized by Wilderness Excursion. For the first time in quite a few treks in different countries, everything went as planned, from being met at the airport on arrival, up to the taxi back to the airport at the end of the trek. Pradip made sure I had all the permits and information I required, attending such matters in person.My guide, Suppa, was cheerful, energetic and patient with the many questions I asked, and made sure I was well fed along the way, even going as far as cooking meals at times. Good cook, too. The teahouses chosen for each night were generally good, given that choice is limited, and the meals varied from good to excellent. Earplugs are recommended for those places with very thin walls. September turned out to be wet or cloudy, or both, so panoramic views were rare, but the scenery was spectacular anyway, and as always, the people along the way provided interesting encounters. I thoroughly recommend Pradip, Suppa and Wilderness Excursion if you are headed to Nepal. 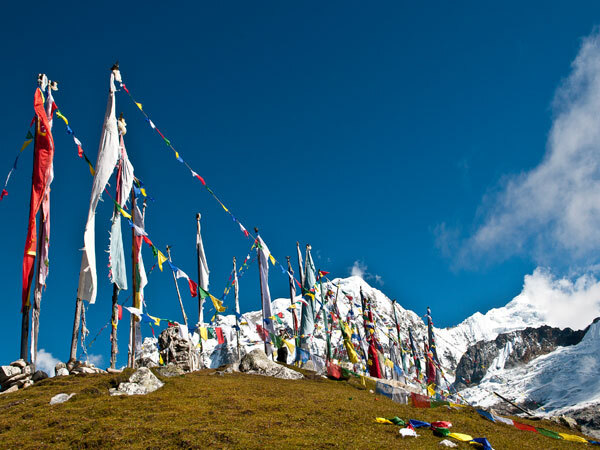 For customized trek package as per your interest; please kindly provide us details like group size, nationality, mode of hotels in Kathmandu and vehicles you would like to use. The price we have offered online includes 3 nights deluxe twin/double room with breakfast in 3 star category boutique hotels in Kathmandu. International Tour Leaders are highly encouraged to get complimentary or discounted rate.